Welcome to "Oklahoma's Intellectual Property"
As a sector-specific business park, TBIP is home to a dynamic, 40-plus member aerospace cluster of top-tier defense companies who are located alongside a growing number of academia and aerospace industry representatives. Aerospace/aviation, telecommunications, environmental services, cyber security, unmanned and autonomous systems and advanced manufacturing are our main areas of focus. At TBIP, you will find flexible leasing strategies which provide cost-control for competition on contracts, a quality environment at below-market rental rates, and a dedicated management team ready to assist you in every possible way. Not only will your company benefit from unequaled geographical proximity to Tinker Air Force Base and the Oklahoma City Air Logistics Complex (OC-ALC), but monthly networking opportunities and other strategic meetings and events provide one-on-one access to key public figures, Tinker Air Force Base officials and national, state and local lawmakers. You will quickly find that we’re so much more than just a "landlord." TBIP is all about business development and mission accomplished. What do TBIP and the Aerospace Collaboration and Partnership Center (ACPC) offer that our competition does not? The simple answer is an aerospace cluster of public and private companies, individual and education/training entities and facilities existing nowhere else in the State of Oklahoma. Others can duplicate brick and mortar, but NO ONE can replicate this synergistic model of over 40 private sector companies, plus labs, research universities and related government agencies, all working together with common visions for Oklahoma and our world-class aviation industry. With two campus locations and more than 30 years of service, along with access to Green Valley Farms Living Laboratory, a 3,500-acre venue for technology innovation and entrepreneurial opportunities for commercialization (see GVF LL tab), no one can match the value-added benefits you’ll find at TBIP. That’s why we’re the largest concentration of high-technology companies at any one location in the state of Oklahoma! The estimated population of Oklahoma as of 2018 is just under 4 million, ranking 28th of the 50 states by population, and 20th by size (square miles). With five military installations, a large National Guard presence and the FAA Mike Monroney Aeronautical Center all located in Oklahoma, aerospace and defense is the second largest industry sector or “ecosystem,” according to the Oklahoma Department of Commerce. Aerospace and defense is a $12 billion business exporting to 170 countries, and directly employing 121,000 people in our state, and the annual economic impact of the Aviation & Aerospace Industry in Oklahoma is almost $44 billion. The five military sites located in Oklahoma account for 5 percent of all Oklahoma wages and salaries, collectively employing more than 69,000 with a total payroll of more than $3 billion in FY 2010. Tinker Air Force Base is the largest military Maintenance Repair and Overhaul (MRO) facility in the world, and the world’s largest commercial MRO is located in Tulsa. Central Oklahoma is not only an aerospace and defense MRO hub, but because of its size, a company based in central Oklahoma has manageable proximity to all five of the military installations. There are currently more than 40 tenants at TBIP North and South, representing the synergistic composition of Tinker Business & Industrial Park. This includes private-sector defense companies, laboratories, career-technical education and public-sector groups, such as the Greater Oklahoma City Chamber of Commerce. In addition, there are six Native American companies; further, approximately 25% of TBIP businesses are small entrepreneurial companies. Of major significance is the fact that the entire TBIP campus is located in a federally-designated HUBZone. "Moog Inc. has been at the TBIP for approximately 10 years. During that time, our business has grown, we have hired additional people and now require a large warehouse area. Based on years of being involved with the TBIP, our choice was to remain with TBIP. TBIP management worked with us to secure the perfect location for our business. Their management was helpful in securing a contractor to do the renovations and to insure it met all of our needs. They went above and beyond in working with us to complete the move in a timely manner. The same dedication has been provided to us with their willingness to take care of any issues that might arise with regard to housekeeping, weather and grounds maintenance. TBIP supports their tenants with networking luncheons, inviting speakers from various organizations to share their take on current events. This is extremely helpful in growing our business. The TBIP is only 5 minutes from Tinker AFB. The close proximity to the base allows Moog to be immediately available for any support required by our customers. We would highly recommend the TBIP as a potential location for business, particularly Defense Contracting." "Choctaw Defense moved to Tinker Business & Industrial Park a little over a year ago as part of our long term strategic planning. Being located in the TBIP defense cluster has allowed Choctaw Defense to forge relationships with other defense contractors, resulting in potential partnerships and business opportunities we would not have had otherwise. Additionally, the Tenant luncheons and events have provided beneficial access to Tinker Air Force Base’s leadership, as well as both state and federal legislative delegations – with the opportunity to share information specific to our defense-related lines of business. TBIP’s management is well connected, and works hard to facilitate business opportunities for their tenants. The pro-business relationship between TBIP’s management, industry and Government leadership is unique to the commercial leasing space and has proven to be an added benefit you will not find at other office locations. TBIP’s strategic focus on aerospace and defense has definitely been a contributor to Choctaw Defense’s continued success." 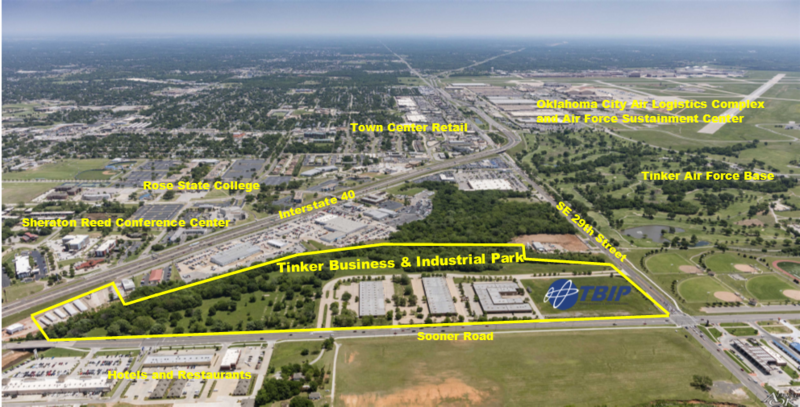 "The Tinker Business & Industrial Park is one of the most important properties in our community. It is a magnet for the tech companies that provide the jobs of the future today. We have enjoyed a close relationship with the owners for over thirty years, and we know they can be counted on to bring some of the best employment opportunities to Midwest City." "It is always a pleasure to work with the staff of the Tinker Business & Industrial Park. They have an impeccable track record in meeting the needs of the aerospace and technology industries. We know they can always be relied upon to cooperate in the economic development projects that make a real difference in Midwest City." "Operations at Tinker Air Force Base have a $4.4 billion dollar annual impact on the state economy. Tinker relies heavily on private contractors to meet its needs, and the staff at Tinker Business & Industrial Park has a proven record in taking care of aerospace contractors in a punctual and professional manner." "Tinker Business & Industrial Park is fortunate to have an ownership and management team that is especially sensitive to the needs of the aerospace industry. They understand what it takes to get a deal done and to keep customers satisfied in a business where failure is not an option." "TBIP is not only a perfect location for doing business between suppliers and the USAF, but Ms. Janelle Stafford is one of the most professional and hard working women supporting that property. On behalf of the Strategic Alternate Sourcing Office, we have used TBIP for various events to include hosting Industry Days for USAF requirements. The facilities are nice, clean, and spacious. The location is convenient for Tinker AFB personnel and the property manager is always courteous and responsive to government requests. Love doing business with TBIP!" Click here to see more Tenant Testimonials!